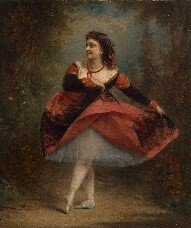 Maria Bonfati in the Black Crook. Oil on Canvas. ca. 1866. “Treading the boards” is a colloquial theatrical expression that refers to the wooden planks of the stage upon which performers ply their trade. Dr. Matthew Wittmann, curator of the Harvard Theatre Collection at Hougton Library, will highlight a simple but signficant point – much of the richness and vitality of the performing arts in American derives from creative talent originating elsewhere. The Victorian stage featured a fascinating mix of performers who enriched American culture. Dr. Wittman’s presentation draws upon materials in the Harvard Theatre Collection to tell the stories of noteworthy immigrant actors and entertainers.